Cherie Aimée plans to do a lot of good for a lot of people. And she’ll get the chance, thanks to a mechanical assist device that took over when her heart stopped beating and served as a bridge to transplant. In her twenties, Cherie travelled all over the country as a coder for tech startups. A decade later, she branched out into advertising, marketing and branding, launching her own firm. The work was demanding and the deadlines fierce. At the height of her success, Cherie was diagnosed with Hodgkin’s lymphoma and underwent six months of chemotherapy. Afterward, her focused changed. She joined the Board of Directors for a non-profit that was treating children with HIV in South Africa. 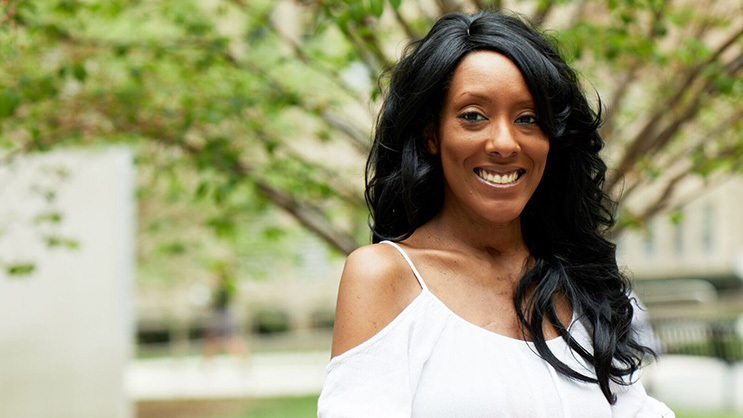 “When I recovered from my cancer, I wanted to help others,” she said, “And so I gave this organization everything I had.” One day, however, Cherie felt faint, and her arms grew heavy. Her husband rushed her to the hospital in Danbury, CT and she flat-lined minutes later in the emergency room. Cherie’s cardiologist put her on ECMO (extracorporeal membrane oxygenation), a machine that took over for her heart and lungs and then called the heart transplant team at NYP/Columbia. Within hours, an ambulance arrived and Cherie was soon in the care of Drs. Yoshifumi Naka, Hiroo Takayama, and Paolo Colombo. The surgeons put Cherie on an LVAD, a circulatory assist device that would keep her alive until they could find her a donor heart. When she came home from the hospital, Cherie went into activist mode. “I couldn’t just sit there,” she said. “While I was getting stronger, I looked into the options for wearing what was essentially a small computer designed to keep me alive.” Within a short time Cherie had produced an Amazon bestseller in the self-help medical category—How to Rock an LVAD like a Fashionista—with tips on how to find a stylish backpack with the right compartments to hold the device and its extra battery. She also started learning more about the transplant process.